Wise Men of Gotham is the early name given to the people of the village of Gotham, Nottinghamshire, in allusion to an incident where they supposedly feigned idiocy to avoid a Royal visit. Cuckoo Bush Mound is the alleged site for the tale of the Wise Men of Gotham’s attempt at fencing in the cuckoo. It is actually a three thousand year old Neolithic burial mound, and was excavated in 1847. The story goes that King John intended to travel through the neighbourhood. At that time in England, any road the king travelled on had to be made a public highway and the people of Gotham did not want a public highway through their village. The villagers feigned imbecility when the royal messengers arrived. Wherever the messengers went, they saw the rustics engaged in some absurd task. Based on this report, John determined to have his hunting lodge elsewhere, and the wise men boasted, "We ween there are more fools pass through Gotham than remain in it." According to the 1874 edition of Blount's Tenures of Land, King John's messengers "found some of the inhabitants engaged in endeavouring to drown an eel in a pool of water; some were employed in dragging carts upon a large barn, to shade the wood from the sun; others were tumbling their cheeses down a hill, that they might find their way to Nottingham for sale; and some were employed in hedging in a cuckoo which had perched upon an old bush which stood where the present one now stands; in short, they were all employed in some foolish way or other which convinced the king's servants that it was a village of fools, whence arose the old adage, "the wise men of Gotham" or "the fools of Gotham". The Towneley Mysteries mentioned the "foles of Gotham" as early as the fifteenth century, and a collection of their jests was published in the sixteenth century under the title Merrie Tales of the Mad Men of Gotham, gathered together by A.B. of Phisicke Doctour. The "A.B." was supposed to represent Andrew Borde or Boorde (1490?–1549), famous among other things for his wit, but he probably had nothing to do with the compilation. The localizing of fools is common to most countries, and there are many other reputed imbecile centres in England besides Gotham. Thus there are the people of Coggeshall, Essex, the "carles" of Austwick, Yorkshire, the "gowks" of Gordon, Berwickshire, and for many centuries the charge of folly has been made against silly Suffolk and Norfolk (Descriptio Norfolciensium about twelfth century, printed in Wright's Early Mysteries and other Latin Poems). In Germany there are the "Schildbürger", from the town of Schilda; in the Netherlands, the people of Kampen; in Bohemia, the people of Kocourkov; and in Moravia the people of Šimperk. 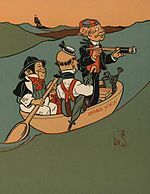 There are also the Swedish Täljetokar from Södertälje and Kälkborgare from Kälkestad, and the Danish tell tales of the foolish inhabitants of Mols, while the Finnish talk of the Hölmöläiset and the Bembölebor. Among the ancient Greeks Boeotia and Cyme were the homes of fools; among the Thracians, Abdera; among the ancient Jews, Nazareth; among modern Jews, Chełm; among the ancient Anatolians, Phrygia. The rhyme was first recorded in Mother Goose's Melody published around 1765, and from then appeared in many collections. Reminded of the foolish ingenuity of Gotham's residents, Washington Irving gave the name "Gotham" to New York City in his Salmagundi Papers (1807). The most notable use of the name in this context was by Bill Finger in naming the home of Batman, Gotham City. The existence of Gotham, Nottinghamshire in the DC Universe was recently acknowledged in Batman: Legends of the Dark Knight #206 (and again in 52 #27), although the connection between two names within the DCU has not been fully explained. In a story titled "Cityscape" in Batman Chronicles #6 it is revealed that Gotham was initially built for the purpose of housing the criminally insane, and Robin reads a journal that tells of how Gotham got its name: "I even have a name for it. We could call it 'Gotham' after a village in England – where, according to common belief, all are bereft of their wits." Responding to the connection between the Gotham, Nottinghamshire and Gotham for New York City, Rudolph Giuliani, former mayor of New York, wrote that it was "a pleasure to have this opportunity to acknowledge the cultural and historical link" between the two places. 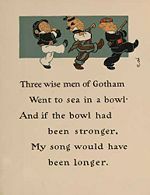 In DC Comics' The Batman of Arkham the Joker recites the "Wise Men of Gotham" rhyme specifically. There is a passing reference to the wise men of Gotham in Lorna Doone. ^ Noodles, Nitwits and Numbskulls by Kurt Werth, Dell Pub Co, 1979. ^ a b c I. Opie and P. Opie, The Oxford Dictionary of Nursery Rhymes (Oxford: Oxford University Press, 1951, 2nd edn., 1997), p. 193. ^ Gerard T. Koeppel Water for Gotham: a History (Princeton University Press, 2001), p. 103. ^ Alfred Stapleton, All about the Merry Tales of Gotham (Kessinger Publishing, 2005), p. 10. ^ Brewer, Ebenezer Cobham (1898). Dictionary of Phrase and Fable: Giving the Derivation, Source, Or Origin of Common Phrases, Allusions, and Words that Have a Tale to Tell. Henry Altemus Company. p. 541. Retrieved December 8, 2014. ^ Gillian Elias, The Tales Of THE WISE MEN Of GOTHAM (Nottinghamshire County Council 1991), ISBN 0-900943-33-5, p. 42, . ^ a b "The real Gotham: The village behind the Batman stories". BBC News. Wikimedia Commons has media related to Wise Men of Gotham. RH Cunningham, Amusing Prose Chap-books (1889). Marvin, Dwight Edwards (1922). The Antiquity of Proverbs: Fifty Familiar Proverbs and Folk Sayings with Annotations and Lists of Connected Forms, Found in All Parts of the World. G. P. Putnam's Sons. pp. 113–120; As Wise as a Man of Gotham. This article incorporates text from a publication now in the public domain: Chisholm, Hugh, ed. (1911). "Gotham, Wise Men of" . Encyclopædia Britannica (11th ed.). Cambridge University Press. This page was last edited on 11 July 2018, at 15:55 (UTC).